Rumbles, cramps and endless sprints to the toilet? Millions of people around the world are annoyed every year by a stomach flu. The disease can quickly render you nonfunctional and utterly miserable. And the worst part, the stomach flu has to run its course. Apply these stomach flu remedies to contain the damages that can be done by the nasty virus. The stomach flu, also called gastroenteritis, is an infection of the stomach and intestines. They are very common during winter, although anyone can catch it anytime of the year. That is why the norovirus that cause stomach flu is called the “winter vomiting bug”. Although it is referred to as the “flu”, it is not a flu. A common flu is caused by the influenza virus, and usually only affects your respiratory system—your nose, throat and lungs. Stomach flu is caused by contagious viruses, bacteria or parasites, but the number one cause is the norovirus1. The stomach flu generally strikes slowly, but can make you very sick. The first symptoms of a norovirus infection are vomiting and diarrhea. Usually it starts between 12 and 48 hours after the virus enters the body. Vomiting is often violent, and can happen very suddenly. This form of vomiting is also referred to as projectile fractures. Nausea, low-grade fever, chills, headache, abdominal pain and abdominal cramps also occur. The body needs to heal on its own from the infection, but fortunately, the symptoms of stomach flu usually disappear after about 1-4 days. In young children and people with weakened immune system, the symptoms may take considerably longer2. If the symptoms worsen, you should consult your general practitioner. Noroviruses are small, highly contagious viruses and are described as the perfect human pathogen due to its ability to replicate very quickly, its low infectious dose and high stability in the environment3. The only way to catch the norovirus is through the oral route4. This means you have to ingest the viral particles into your gastrointestinal system, which can be through your mouth or nose, or potentially (but not likely) by rubbing your eyes. It is not possible to breathe in the virus particles4. Once the virus is ingested, they enter your small intestine, where the virus begins to multiply. The virus then hold on to the lining of the intestine and releases its genes into the cells. These genes are able to shut down the normal functions of the intestinal cells and start taking control of the cell in order to make more viruses. Basically, your own cells become factories for virus replication. As a last step, the cell breaks down and new copies of the virus are released and start to repeat the process5. Your body is able to recognize that these intestinal cells are dying, and starts producing B-cells and antibodies. These antibodies then travel to the small intestine and inactivate the virus. Diarrhea and vomiting are also responses to the infection. The diarrhea helps with removing the viruses from your intestine, but the vomiting is not helpful, as the viruses are not located in the stomach. From the time norovirus is inside your body, it can multiply very quickly, in as little as 12 hours. This means a whole lot of pain: severe diarrhea, uncontrollable vomiting (sometimes at the same time), dehydration and weakness. All at varying degrees, before you even know what attacked. 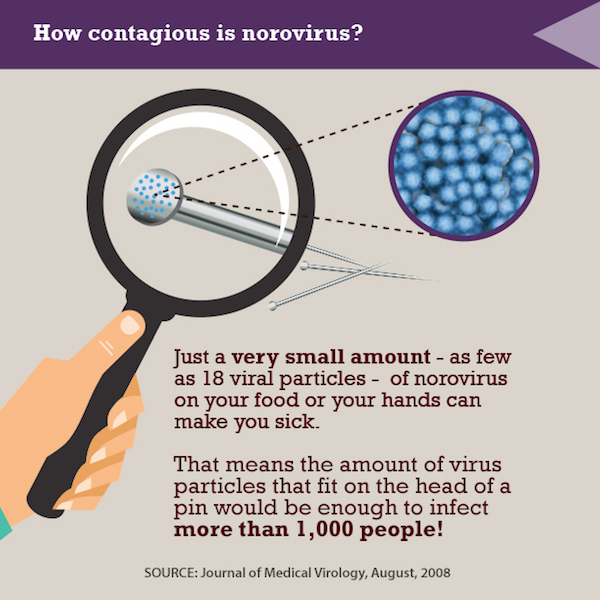 Noroviruses are very contagious and can survive for a long time in the body. The virus can be active outside a host (person) on surfaces such as counters, toilets, doorknobs and even clothing. It is unknown exactly how long the virus can live outside a host, and is dependent on several factors such as temperature and the nature of the environment. In addition, they are resistant to many disinfectants. About 45% of people infected with norovirus are affected by stomach complaints. The other 55% do not get the stomach flu, but they can still carry and transfer the virus. There are two important ways to get infected: from human to human, and via contaminated food or water3. Noroviruses are present in the feces or vomit of infected persons. They are often passed through contact with the hands. Even a thorough wash after a toilet visit can’t always prevent the presence of minuscule particles of infected feces. If an infected person shares food or comes into contact with food (e.g. when harvesting or serving), the virus may end up in the food and infect new people. Water can also be a source of contamination. Eating (raw) contaminated shellfish such as mussels and oysters or eating raw vegetables and fruits, in particular soft fruits are susceptible to contamination, that are infected can transfer the virus. Fluids are critically important since you’re losing vital bodily fluids through sweating, vomiting, and diarrhea. The best fluids to drink are clear liquids, such as water and broth, which can help to replenish electrolytes, or certain herbal teas. It is recommended to avoid caffeinated drinks or liquids with higher acidity such as sodas and energy drinks, as this may upset the stomach even more. Probiotics are one of the best things to take when fighting the stomach flu virus. This is the time to definitely step up your intestinal defence army by taking a dose of probiotics every 2 hours. If you vomit it out, take it again. It will help the nauseous feeling and contain the diarrhea, stopping the symptoms faster than if you did nothing. Ginger is a spice that is traditionally used to treat indigestion, nausea and vomiting6. The spice is known for its anti-inflammatory, antibacterial, and anti-viral properties that can provide relief from cramps, diarrhea and nausea caused by the stomach flu bug. Ginger also plays a role in inhibiting serotonin receptors at the level of the intestine and brain7. The best way to ingest ginger is by eating it in small pieces of raw ginger, or drink lemon-ginger tea from freshly chopped ginger. Teas such as peppermint, oregano and thyme are particularly effective in treating a queasy stomach. These herbs are known for their digestive-soothing and anti-inflammatory effects. Make a cup of tea and let it steep for five minutes then slowly sip it to allow it to work in your digestive tract. Oregano oil is reported to be able to destroy the outer wall of the virus. Carvacrol, the substance responsible for the aromatic flavor and odor of oregano oil, has the ability to break down the tough protein layer surrounding the norovirus. As a result, the antiviral substance from the oil can enter it to kill the virus8. The active substance in the oil was tested on lab mice variant of the norovirus. In addition, carvacrol or oregano oil may be used as a disinfectant for food and perhaps even for surfaces. Take a tablespoon of manuka honey in a cup and add ¼ teaspoon of cinnamon and mix them. Manuka honey is an excellent food that kills any viruses and bacteria. Cinnamon is a spice with the highest antioxidant activities. They work together powerfully to kill the virus, strengthen your immunity and reduce inflammation. Just be sure you keep a tub of real cinnamon at home during flu season. After a bout of vomiting and diarrhea, you may feel sore on your insides. At this time, you may even feel hungry. It is not a good idea to start eating to fill up the stomach. Go slow, have someone make for you some carrot juice that you can drink throughout the day. Carrot juice is very calming to the stomach and is also healing. If you have access to fresh young coconut water (not those from boxes! ), drink it throughout the day to not only replenish your lost electrolytes, but also to soothe the stomach and protect your kidneys. Banana is another tummy-soothing food. This should be your go-to food when you’re feeling hungry after some purging. If you are caring for a loved one or have been around someone who has the stomach flu, take care of yourself and prevent the stomach flu from affecting you, especially if you tend to catch a bug easily. This has to be done within 12-24 hours of being in contact with someone who has caught the bug. Be sure that you are not yet vomiting—once you have vomited, this remedy will not work. Drink a glass of pure grape juice three times a day for at least 3-5 days after being exposed. The juice has to be just pure grape juice, with no sugar added. The grape juice works by alkalizing the pH in your intestinal tract. It also has a certain compound that prevents the norovirus from clinging on to your intestinal wall to multiply. See the beauty of natural foods? There are many reports of grape juice being beneficial in this case. I’m guessing that other juices such as cranberries and tart cherries may also be helpful. It may be cumbersome to juice when you have to care for a sick family member. This Welch’s 100% grape juice concentrate works just as well. It has no sugar added and may be the perfect, convenient juice for preventing the stomach flu. If you’re in the USA, it can be delivered to you right to your doorstep. Remember though, only drink this for prevention. Once you start vomiting, it does no good. Keep some in the fridge for times like this, although be aware of the expiry date. It has a short shelf life as it is pure juice. As a last note, it is wise to avoid certain foods when having the stomach flu. What you don’t eat is as important as what you should eat. Some of the foods that you should absolutely avoid after your bout of vomiting and purging are: Sugary foods, dairy products, flour products, coffee, alcohol, spices and highly fatty and greasy foods. These foods will only further irritate your digestive tract.